Paint with crayons with the Cray-Pen Colored Wax Painting Tool. Using the wax from regular crayons or encaustic cakes, easily blend and build layers of vibrant, high-gloss color to achieve effects of oil painting that dry in seconds. 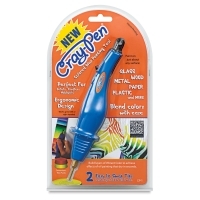 The Cray-Pen is a wallet-friendly alternative to oil paints and encaustics. 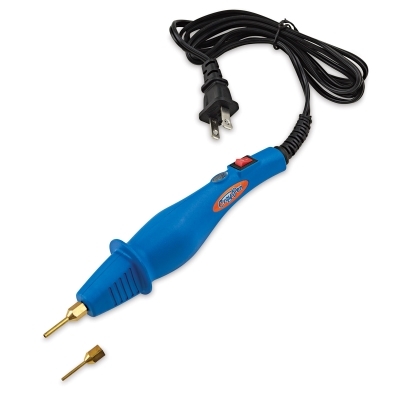 Just heat up the tool, dip the hot metal tip in wax, and gently touch the tip to your painting surface — it works with most plastic, wood, canvas, glass, metal, and paper. 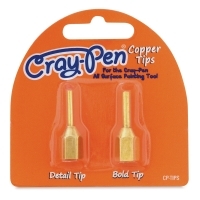 Two easy-to-swap copper tips (included) let you work in bold or fine detail. To clean, wipe the tip with a thick paper towel, being careful not to burn yourself. No solvents needed. The Cray-Pen Colored Wax Painting Tool’s ergonomic design works great for right- or left-handed users, and it plugs into a standard 120V outlet. 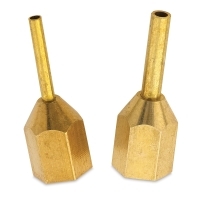 Copper Tips Replacement Pack — This pack of two replacement tips includes a 0.062" detail tip and a 0.075" bold tip. ® Cray-Pen is a registered trademark.